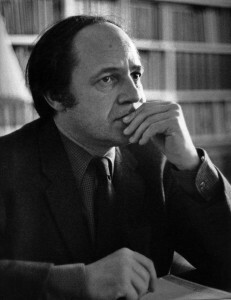 IT was the mid-1960s, I was in my late teens, I was already becoming familiar with post-war avant-garde music, yet the first time I heard Pli selon Pli by Pierre Boulez, who has died at the age of 90, I couldn’t make head or tail of it. Something in the back of my head, however, insisted that the problem was mine, not the music’s, driving me back to hear it a second time when he conducted it in London again a few months later. This time I was rewarded by a musical experience as scintillating, diaphanous and transcendent as I’ve ever had. When I talked to him about his music a year or two later, I immediately connected the experience with his description of music as ‘controlled hysteria’, an effect which is highly calculated but produces in the listener a peculiar kind of euphoria, a free-floating intensity that can also be found in certain old time composers like Perotin or Tallis, even Beethoven, at least in the readings of certain symphonies by certain conductors–try listening to Boulez’s recording of Beethoven’s Fifth. I liken my encounter with Pli selon Pli to the first time I saw the films of Glauber Rocha, two of them on the trot at a press show in London in the early 70s, Black God, White Devil and Antonio das Mortes. Again, I couldn’t make them out at all, but I left the viewing theatre with the feeling that the world of cinema had changed, a new dimension had been added–and again this new beauty would be revealed by subsequent viewing. The film almost didn’t happen. With my brother Noel as producer, it was commissioned by a BBC2 arts magazine in unusual circumstances–this was long before the BBC adopted the policy of ‘Producer Choice’, whereby a significant proportion of programmes were made by independent producers on the Channel Four model. Just as the contract was ready to sign, someone realised that it would involve an independent film crew shooting on BBC premises and that this raised a union issue. The sticking point, I seem to remember, was whether the BBC’s house union would allow us to work with an ACTT electrician, or something like that. It was the BBCSO’s genial manager who resolved the problem, because, he told us, he wanted to see the film made. For me, it was a very educational episode, and a few years later the subject I took up for my first scholarly monograph was the history of trades unionism in the film industry. The film as broadcast was not quite as we delivered it. The programme editor decided to lift out the sequence of Roger Woodward at home practising and run it as a trailer the week before, so the version transmitted was shorter; in cutting it down, they also lost the end of a long take I was particularly proud of, which is seen here at full length. Boulez was in many ways an ideal subject for a first attempt at what was already an established documentary subgenre, the artist portrait, where you follow your subject over a segment of their professional life and interview them. He was never fazed in the slightest by the presence of the camera, on the contrary, he acknowledged it, held the door open for it, even spoke to it. The moment at the beginning of the film when he gets into the car, drops the scores in his arm (into the lap of the unseen sound-recordist lying on the floor), and bending to pick them up remarks, ‘Whoops, that was absolutely live, you know’, this was a gift–a completely unforced moment of documentary self-reflexivity. The film is built around his incisive and Adornoesque analysis of the history of the figure of the conductor and the social function of the symphony orchestra. I saw his own occupancy of the position in practice in numerous rehearsals. Watching him at work on his own Eclat/Multiples, struggling to read the extremely complex score open on my knees, was revelatory. His method was to prepare sections separately and then to put them together, at first below tempo. Then, when he saw that they fit together, he would play through at speed. I remarked to him that this was particularly instructive for the listener; it revealed the structure, and then produced the exciting sense of suddenly realising the depth of the texture when, listening to the whole construction, you lost hold of the individual lines you’d been following previously: what happened now was that different parts of the texture advanced and receded, the whole thing becoming a pulsating, living organism. Boulez’s response was a wholehearted agreement that this is what should happen, and when he himself felt it happening he knew that the music was working. He also had immense patience with the players who were sometimes struggling with the unfamiliar idiom, especially an elderly fellow at the celesta who was trying to make his tinkles as ‘expressive’ as he could. Quite the opposite of what he wanted, Boulez courteously asked him to repeat the phrase several times over to expunge all trace of expression and simply let the notes sound. I doubt that any other conductor would have got away with this, but the musicians were in awe of his extraordinarily accurate ear. (He could spot a single wrong note in an orchestral tutti at a hundred yards.) Indeed on one occasion–the dress rehearsal of Pelléas et Mélisande at Covent Garden–he began by tuning the orchestra up section by section, even after they’d tuned themselves. I have seen orchestras behave badly towards one conductor or another. Boulez commanded absolute respect, without ever raising his voice, though he would sometimes throw an offender a withering glance. The sparkling clarity of his performances made new sense of music familiar as well as unfamiliar. For my part, I had no great love of Bartok’s popular Concerto for Orchestra until I heard Boulez perform it. On one occasion, he stood in for Klemperer who had fallen ill (and whom he greatly admired) in a performance of Beethoven’s Ninth, which was not in Boulez’s normal repetoire. I do believe that the Philharmonia could have given a Klemperer performance of it without anyone on the podium. How did Boulez deal with the problem? He chose faster tempi, resulting in a slightly scrappy but tremendously exciting rendition. He was completely aware of the difference between rehearsal and performance. I particularly remember when he first turned to Mahler, and I followed the trail through a couple of rehearsals and the performance (I think it was the Sixth Symphony). In rehearsal he keep a tight rein, but he and the orchestra knew that on the night they could let rip, as they did, to give the most stupendous performance of it I had ever heard. I told him it would be wonderful to hear him do Mahler’s First, but he said he couldn’t, it had been completely ruined for him once when he was visiting the music department at Harvard in the early 60s, and one night he was disturbed by a record player blaring out of an open window nearby: it was the first side of Mahler’s First, over and over again. He had his musical blindspots, of course. The most difficult to forgive was Mozart (but he once did a Mozart piano concerto with, if memory serves, Alicia de Larrocha, and made a perfectly elegant job of it). And I was once the recipient of one of those disapproving looks when I said something about Weill. Adorno had begrudingly acknowledged Weill’s genius in reviewing Die Dreigoschenoper, but Boulez had even less interest than Adorno in commercial music of any kind. He would not have recorded those pieces by Zappa if he hadn’t thought they were musically interesting. But the composers whose entire oeuvre he would never conduct was not simply a matter of personal taste. Those who were anathema invariably wrote the kind of music that Adorno called ideological–they failed to challenge the social order: past composers like Tchaikovsky or Sibelius or Richard Strauss, or those of his contemporaries who continued to write in a harmonic language. He considered Britten to be vulgar: the War Requiem was like ‘incidental music for a film by Cecil de Mille’. You can see the logic, even if you don’t agree. His legacy as a composer is something else again, the very embodiment of the freedom of spirit that is music’s special gift. It was a great privilege to make a film with him, and have got to know him as well as I did. This entry was posted in Cultural Politics, Documentary, Music, Politics and tagged BBC, Music, Politics. Bookmark the permalink.